The Inter-American Commission on Human Rights has issued a call on the Guyana Government to play closer attention to the rights of all citizens. The call from the international organisation comes in response to a recent interface with a number of rights groups from Guyana and the Government of Guyana. Four Guyanese civil society organisations – Red Thread, Artistes In Direct Support (A.I.D.S. ), Family Action Consciousness Togetherness (FACT) and the Society Against Sexual Orientation Discrimination (SASOD) presented submissions at a hearing of the Inter-American Commission on Human Rights (IACHR) on “Violence, Sexuality and Gender Issues Affecting Children in Guyana”. The event took place in Washington DC on Monday, October 28, 2013. According to the groups, the hearing focused on three specific issues currently affecting children in Guyana: (1) corporal punishment; (2) discrimination and abuse based on sexual orientation and gender identity; and (3) comprehensive sexuality education in schools. The meeting was told that although guidelines exist in Guyana, the use of corporal punishment in schools is commonplace, to the extent that teachers appear not to recognize when they are using this form of abuse on the children in their care. “Children have suffered needless injuries because of teachers’ violence. Past newspaper reports of dislocated shoulders, fractures and marks left on children have only served to intensify the chorus that children are out of control and that teachers need protection. Eight-year old Guyanese Daria Nicholson, who presented at the hearing, described her feelings of shame, anger and sadness having received several lashes from her class teacher because she forgot her exercise book at home. She was never asked by her teacher to provide an explanation”, the human rights group was told. “Corporal punishment must be abolished,” De Souza reiterated at the hearing. Executive Director of Artistes in Direct Support Desiree Edghill, said a number of non governmental organisations in Guyana have been working along with the teachers to implement the Health and Family Life Education (HFLE) programme in schools but they found that the teachers were not only behind in the roll-out of the HFLE manual, but they were also selecting certain exercises to conduct, rather than following the format of the manual and how they were trained to execute them. Edghill said “It is important to follow the format, because the exercises build on and flow into each other. She also reported that children were more comfortable discussing sexuality and gender issues and issues of abuse with NGO staffers, rather than their teachers. Guyana’s Minister of Human Services, Jennifer Webster responded on behalf of the Government and spoke about some of the initiatives that the government has been looking to employ to address the issues raised by the rights organisations. She told the meeting that some advancements were made but spent much of her time responding to individual cases raised by the groups that attended the meeting. Minister Webster reported at the meeting that the National Assembly has convened a special select committee to hold public consultations on the issues raised by the groups and that those meetings were still ongoing. However, one of the Commissioners of the IACHR made it clear that human rights shouldn’t be put to a vote, and that the issues need government leadership, even in advance of public opinion, including positive measures to prevent violence. 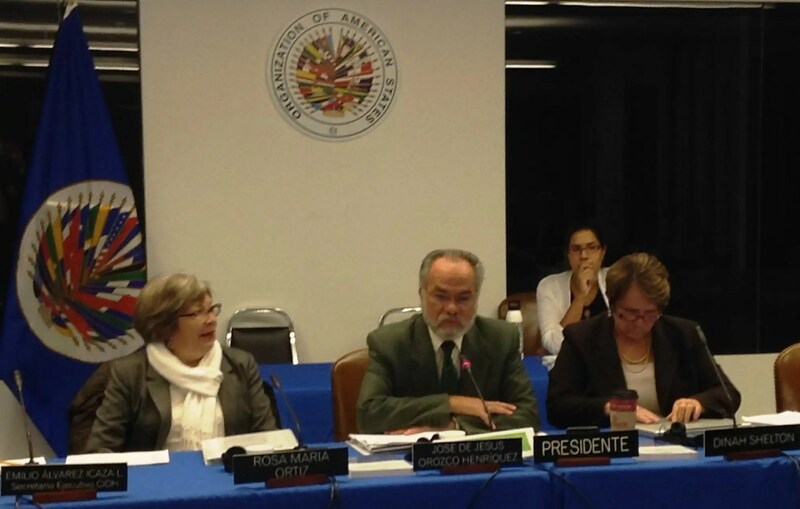 The IACHR is a principal and autonomous organ of the Organization of American States (OAS). According to a joint statement from the four groups that made presentations at the forum, their participation was supported by the European Union, through the European Instrument for Democracy and Human Rights, Equal Rights Trust, Heartland Alliance for Human Rights and Human Needs, COC Netherlands and the Caribbean Vulnerable Communities Coalition. One Response to "Human Rights in Guyana is not a vote issue -IACHR"